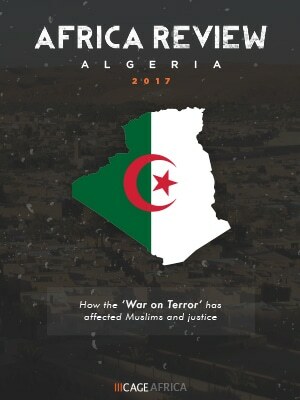 This review provides a snapshot of how the ‘War on Terror’ has affected justice and society in Algeria. It starts by looking briefly at the history of the country up to its recent role in the US-led war. The review also explores counter-terrorism legislation, prominent terrorism cases, instances of rendition and the history and current situation regarding torture as a practice in the country. Specific instances where the West has been complicit in violence are also explored. The report makes essential reading for anyone interested in gaining a deeper insight into how the ‘War on Terror’ works, and in particular the challenges facing Muslims and all citizens in this toxic global climate. For more information or to add your opinion or story to the report, please email karen@cage.ngo.